Kon-Tiki is one of the top grossing films in Norway and also the highest invested in Norwegian movie history. It is a historical drama film based on Thor Heyerdahl and his Kon-Tiki expedition of 1947. Especially, Kon-Tiki is the first and by far the only Norwegian film that has been nominated for both an Oscar and a Golden Globe. Although it was released initially on Norway on August 18, 2012, it was not put on US Theater until April 26, 2013. With the availability of its DVD, many people want to treasure up this famous Norwegian film by turning it from DVD to digital copy in forms of MP4/H.264, AVI, MPEG, WMV, M2TS, MOV, M4V, FLV, etc since it is totally permitted to convert one's own DVDs according to Norway DVD Copyright Laws. Here we introduce WinX DVD Ripper Platinum, a fast, quality-reliable and hassle-free DVD backup tool for movies like Kon-Tiki. Only if you have a Windows computer (PC), you can download it for DVD ripping use, regardless of the high-tech copy protections inside the DVDs. If you have a Mac computer, you may download the Mac edition. Note: The software developer only advocates ripping/copying DVDs for personal use and suggests referring to the DVD copyright laws in your countries before doing it. What if you want to copy DVD Kon-Tiki in intact DVD structure and original quality? What if you need to convert DVD Kon-Tiki to different video formats? What if you have different devices? Don't worry! The single Windows DVD ripper software piece can do all that for you. 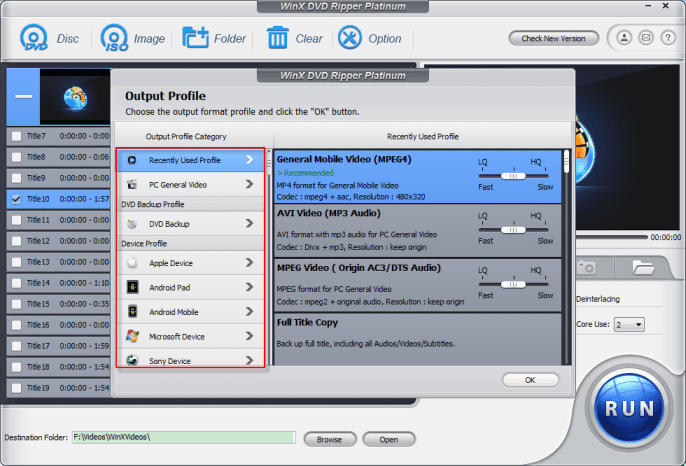 Install WinX DVD Ripper Platinum or (for Mac) following the Wizard, launch it, click DVD Disc before or after you insert the DVD into your DVD-ROM of PC, and let the software load the movie and check the main title for you. Note: It also accepts ISO image and VIDEO_TS folder as the source. Among the numerous options, you can surely find the desired output format you need, from PC/Mac/Web video formats, to Apple/Android/Microsoft/Sony devices. In an unusual technique, this Oscar film was shot in both Norwegian and English dubbing to orient global audiences. Since WinX DVD Ripper Platinum is an advanced DVD copy program, it enables you to select language audio and subtitle track for better understanding. You can even add your own external SRT subtitle files. Besides, titles merging, video cropping and video trimming are all made possible. You can also change the destination to save the output Kon-Tiki video. Hit the "RUN" button and go! After a while, you can have a high-quality Kon-Tiki movie video in your hard disk. In corresponding specification, resolution and aspect ratio, you can transfer it to different devices. After DVD decrypting and converting at one go, you can play Kon-Tiki film on iPhone 6S/6/5S, iPad Air/Mini, iPod, Apple TV, Samsung Galaxy S6, Note 5/4, Google New Nexus 7, HTC One, Kindle Fire HDX, WP8, Surface Pro 4, Xbox One, Sony PSP/PS4, iTunes and so on. It also supports copying DVD Kon-Tiki to DVD folder, ISO image and MPEG2 file without quality loss. The DVD ripping software can rip and copy other native Norwegian movie DVDs, such as I Am Yours, Pornopung, In Order of Disappearance, Blind, O'Hellige Jul!, Søsken til evig tid, Let the Scream Be Heard, A Thousand Times Good Night, De tøffeste gutta, Pioneer, Utopia, and Karsten og Petra blir bestevenner on PC or Mac. Norwegian films - Norwegian films in 1930s, 1940s...2010s.